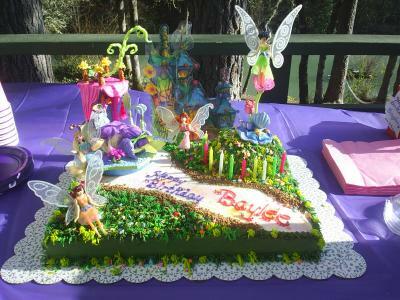 This cake was for my granddaughter's 10th birthday. Every year, at the end of her birthday, she tells me what she wants for her next, so I have a whole year to plan a cake and as you can see, she likes them elaborate! I collected the brightest colored butterflies, flowers, fairies and made the bedding for the fairy bed. I created a knoll out of a cupcake and created the fence out of 10 neon candles. She and her friends loved this cake! How did you make the grass bits round the side? How did you make or where did you buy the fairies? I love it, What makes the grass? Join in and write your own page! It's easy to do. How? Simply click here to return to Fairy Cake.